After solving a murder, gift shop owner Stormy Day is famous in Misty Falls. “Stormy ranks right at the top with the mysteries I’ve read, laughed at and loved.” – Barb S.
“If you like good mysteries with lots of twists and fun along the way, this is the perfect series for you.” – Sewanee K.
“If you like the Stephanie Plum series, you can’t help but like Stormy Day!” – Kristie A. “Engaging characters to love.” – Vi Marie S.
“Refreshing and new… I love the cat and all other characters.” – A. K.
“Book 2 kept me up late, reading just one more chapter, and guessing right up until the end! 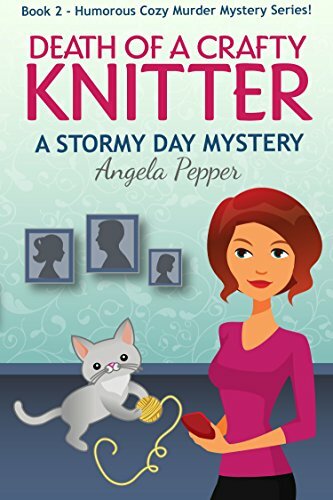 I loved Book 1 Death of a Dapper Snowman, and I didn’t think it would be possible, but Stormy’s Book 2 was even better!” – Jayne M.
This is the Kindle version of Death of a Crafty Knitter (Book 2 of a Humorous Cozy Murder Mystery Series): Stormy Day Mystery #2 that you can also download and read on your computer and mobile phone. Kindle books are DRM protected and therefore, unlike ebooks that are in PDF or ePUB format, you cannot read this ebook without the official Kindle Apps.